Anthony Watts is complaining that scientists didn't use data that has yet to be published. What? He did post an article about Hausfather17, which I've just written about. Anthony's almost as nuts about this one as he was about the NOAA paper, Karl15. His headline was: Yet another study tries to erase “the pause” – but is missing a whole year of data. The new paper uses data to the end of the full year that's currently available - 2015. Since the paper would have been completed some months ago (it's just been published), not only would December 2016 data not have been available (it isn't yet), but the most recent months this year would not have been available to the authors, unless they had a Tardis. Personally, it looks just like ignoring the most current data available for 2016, which has been cooling compared to 2015, invalidates the claim right out of the gate. If a climate skeptic did this sort of stuff, using incomplete data, we’d be excoriated. yet somehow, this paper using incomplete data gets a pass by the journal, and publishes with 2015 data at the peak of warming, just as complete 2016 data becomes available. As if a fake sceptic would take the time to "do this sort of stuff". Not only are they incapable, Anthony Watts finds it easier to do nothing except falsely accuse scientists of fraud - without understanding the data. Anthony Watts ignores SIX YEARS of data! Heck! Anthony hasn't even published the paper he promised way back in July 2012 - and that didn't use current data. In his AGU poster on the subject in December 2015, he only used data to 2008! Not only did he not use data to 2015 in December 2015, he didn't use data for 2009, 2010, 2011, 2012, 2013 or 2014 - all of which was available to him! Anthony thinks the oceans cooled this year - he's wrong! What’s missing? Error bars showing uncertainty. Plus, the data only goes to December 2015. They’ve missed an ENTIRE YEAR’s worth of data, and while doing so claim “the pause” is busted. It would be interesting to see that same graph done with current data through December 2016, where global SST has plummeted. Looks like a clear case of cherry picking to me, by not using all the available data. Look for a follow up post using all the data. No Anthony. The "Error bars" aren't missing! There's still more. Remember how I surmised that Anthony Watts didn't bother to look at the paper. It turns out he didn't even look at the pictures in the paper. He complained: What’s missing? Error bars showing uncertainty. What more can I say? Except Anthony Watts has lost it (again). Deniers cannot do anything but deny and make up conspiracy theories. It's hard to believe that they like to call themselves "skeptics". Not a single one of them took the time to do what Zeke Hausfather and his colleagues did. No. That would be too hard, and if they'd put up, they'd have been worried that they'd have to shut up. Shub (@shubclimate) doesn't know one end of a circle from the other, and his reasoning is off, big time, as is his knowledge about the work. He clearly hasn't bothered to take the time to understand the paper or Karl15. He's no excuse. It's open access. I commented on Twitter on this paper. The authors claim they validate and/or cross-check Karl et al adjustments by comparing ERSST4 against ‘instrumentally homogenous’ temperature records (IHSST) from buoys, and the like. 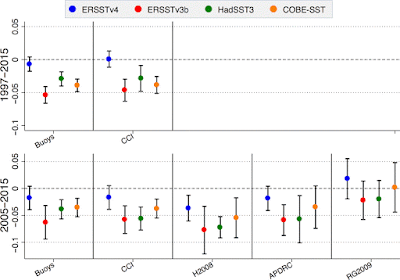 Karl et al adjustments were made on the reasoning that buoys had a cool ‘bias.’ Now, the authors say they see the adjusted SSTs match buoys. This is circular reasoning. Additionally, the other IHSSTs used by the authors are themselves buoy-dependant, as the authors themselves admit. When will we put a full stop to flawed non-independent reasoning in climate science? Of course, I could be wrong and I am happy to be educated but this sort of thing seems to repeat itself in climate science a lot. The author list is not confidence-inspiring either. It looks as if Kiwiseven is struggling with the complexities of measuring changes in sea surface temperature. Surely if they used consistent measurement techniques from buoys from 1998 to 2016, the fact that buoy measurements were slightly cooler than ship measurements is entirely irrelevant. The amount of warming should be similar even if measured from a slightly lower baseline? The point is that the proportion in the mix changed, with buoys increasing relative to ships. But why try and integrate different datasets with different measurement techniques. Why not create a buoy based dataset and a separate ship based one? 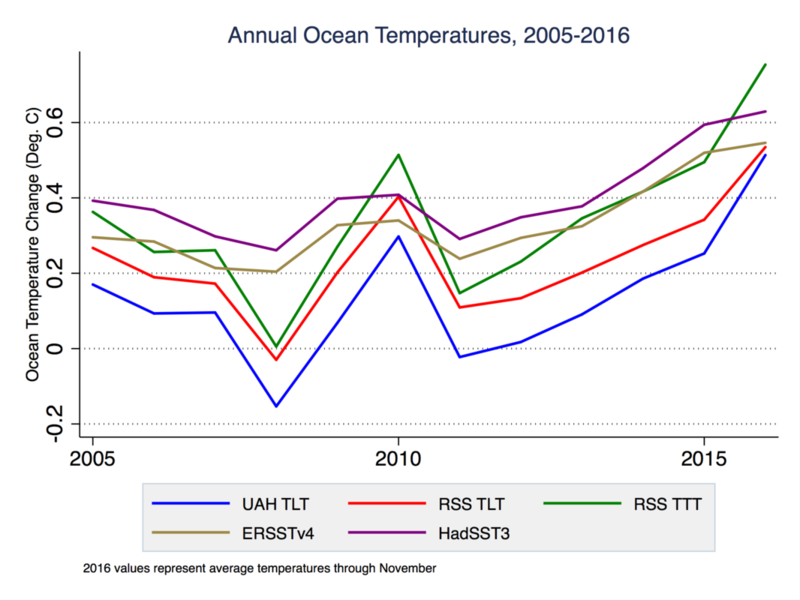 I challenge you to find me an Ocean temperature record that was cooler on average in 2016 than in 2015. I for one haven’t been able to. The reason that the figures shown in the paper end on January 1st 2016 is that we submitted the paper for publication in March 2016. No nefarious hiding of the data involved. I don't know where deniers get their weird ideas from. Jon didn't bother to read this latest paper, or the ones on ERRST v4, or Karl15 - or he'd have known that the composite data sets use measurements from both ships and buoys, and more. Didn’t NOAA reject buoy temperature in favour of ship temperature to get a higher reading years ago? Now it’s back to buoys! Sounds like the Apocalyptics go wherever it’s hottest to get the result they want. I wish people would look up and cite, instead of just proceeding from an unanswered question. The answer is they didn’t. Is’nt it amazing? Climate psyientists can always manage to find a “cold bias” in the data, but never a “warm bias”. Sheesh. That's enough. Like I predicted in the last article, Deniers are never satisfied - "something must be wrong" with everything science. I'll just point to the comprehensive list of references in the main HotWhopper article on Hausfather17. 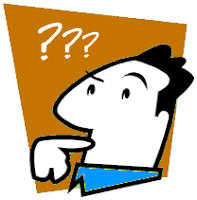 It seems to me that regardless of what is the subject of any article the type of people who follow WUWT repeat the same self reinforcing monologue time and time again. Over the years the tone has changed from disputing aspects of an article to now concentrating on saying any article is suspect because it is science and does not fit their world view. I guess when you have no alternative in facts your last defense is to just say " It is wrong ". Not exactly a very solid footing to work on i feel. That is exactly what I see, John. For many of Anthony Watts' fans, it doesn't even matter what the topic of the article is - they'll post similar comments no matter the subject. A knee jerk reaction against knowledge (they despise it). That is what I think too. They are well-trained "useful idiots". I always have a giggle when these type of blogs go around asking for donations. They are basically asking the people they have been conning to pay for the conning. type of people who follow WUWT repeat the same self reinforcing monologue time and time again. Yes, there's a lot of hand-waving "it's wrong" comments, but the most hypocritical are the "can't trust them, they've altered it" ones. They just don't get the fact that when I comment it is, purely and simply, in support of the science. They reflexively think I'm a "Warmunist" - because their motivation comes from the ideology of the right-wing. Never occurs to them that someone should just advocate the science for it's own sake. Motiveless save for the blindingly obvious fact that it works and in the case of CO2, for around 150 years. The hypocrisy I talk of is the singling out of UAH as the "Gold standard" because the surface record is "altered". Point out the "altered" record of that and RSS, and they have no answer of course. Doesn't stop them finding one and blustering about it. There's a thread where I had a go with Bill Illis re that and the fact that that there is a disconnect from '98 on the MSU to AMSU changeover and you get the "radiosondes are wrong" type reply (actually Watts replied to me with that type of response on another thread) .... completely missing the illogic of thousands of sondes going "wrong" at the point that ONE sensor was changed !! Anthony Watts: "They’ve missed an ENTIRE YEAR’s worth of data, and while doing so claim “the pause” is busted." Does WUWT still claim there was such a thing as a "pause"? In 2017? It was already pathetic before, but now it is downright crazy. You know, I thought that deniers and disinformers would start to behave more reasonably now that Trump and the Republican deniers own the USA. It seems to me that the opposite has happened. They're just as "batshit crazy" as ever, if not more so. In my opinion the "pause" is one of those zombie memes such as "hide the decline" that can be used long after they are dead and rotting. I think WUWT and his backers knows this. I think President-elect Trump has shown you can use a lot of incoherent nonsense sprinkled with a couple of memes to satisfy people's confirmation bias or mistrust. It's a cheap salesman trick. No warming since last Wednesday! This is really crazy. I have used my response to the Hausfather article to patiently explain again why there is no such a thing as a pause and never was. Not only are ERSST v4 DEC - NOV temps 0.05C hotter than the same period last year as Sou demonstrates, but GISTEMP, which *incorporates* ERSST v4 for its SST, is a whopping 0.18C hotter than DEC - NOV last year as well. So go ahead and use the 2016 data, Anthony, and see how far that furthers your cause (or, should that be 'pause'?). Sheesh, what a pack of raving, innumerate lunatics. Any one with functioning logic circuits would find reading WUWT for an hour or so a confirmation of climate change science. The amount of gibberingly stupid logical contortions they need to do to refute the science shows one the intellectual bankruptcy of their position . "Das ist nicht nur nicht richtig, es ist nicht einmal falsch!" Climate change denialism supports the proposition that there is one way of being right, and countless ways of being wrong. Yes Nick - but it's all the EN's fault you see. Seen from their perspective of the "pause", it's that damned EN wot did it, and well, it's cooling now innit, stands to reason. They are desperately hanging on to "Monckton's pause" for dear life and the concept of a long-term trend doesn't scan (as if anything sensible does). I once posted up a WFT's graph showing that the "pause" was actually a step-up that would not cross the long term trend from prior 1997 until 2025 .... but no, anything that happened before that Nino didn't count. Excellent article. Makes it clear everyone except Republicans and WUWT denizens (i.e. the 'ideologically challenged') that the rate of warming hasn't changed in decades. And... the adjustments NOAA have been making were valid all along. But, but, haven't we seen WUWT docking off the recent upsurge in temperatures on numerous graphs of their own making? It's even dumber: Watts is claiming the record hottest year itself demonstrates global cooling! AW writes: "...I contend that the data should be updated in the paper before publishing it. A year long gap, with a significant cooling taking place, is bound to change the results." As Nick Stokes pointed out, yes it does change the trend -- it increases it. As Mosher pointed out, a crystal ball would have been necessary to include 2016 data given the paper was submitted in March of 2016. Geez. Watts is complaining about the paper not using data that didn't come out until months after the paper was completed? How sad do these guys need to get? >> after the paper was completed? No, no - he was complaining about the missing data that was not only not available, but that if it had been available would have strengthened the "warmist" conclusions of the authors. There is only one possibility -- Anthony Watts is a shill for a giant secret Alarmist Conspiracy. Urgently need to look for funding links between WUWT and the dreaded IPCC.